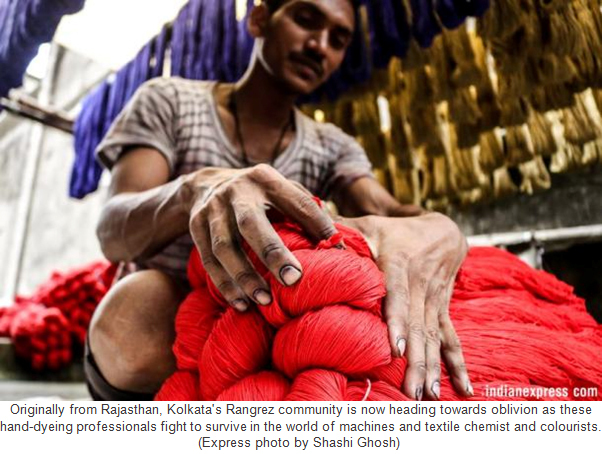 Originally from Rajasthan, the Rangrez community is now heading towards oblivion as this hand-dyeing professionals fight to survive in the world of machines and textile chemist & colourists. Kolkata’s Zakaria street is famous for Nakhoda Masjid, its mouthwatering food, clustered bylanes with cargo movers and shops selling glass bangles and ittar. 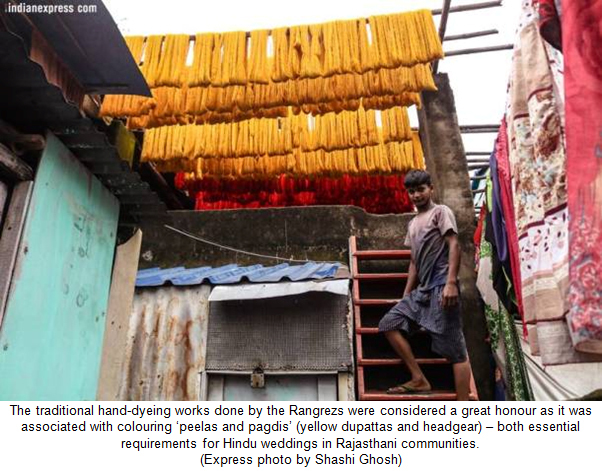 But oblivious of the buzz around, Rangrez – a community of Muslims who dye clothes and threads to earn a living – is battling hard to sustain their profession and livelihood. Though the name of community may have been popularised in Bollywood songs, knowledge about them is almost negligible. 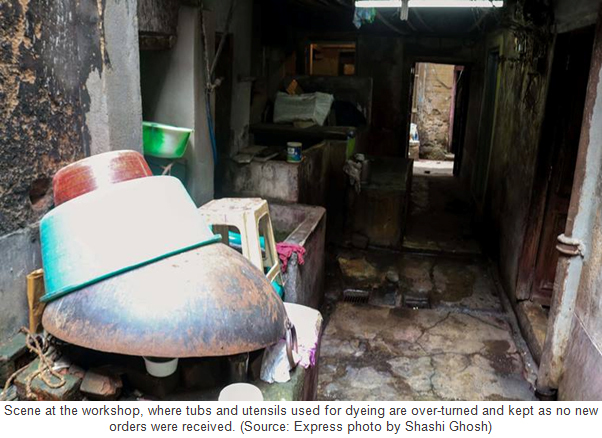 Originally from Rajasthan, the community is now heading towards oblivion as this hand-dyeing professionals fight to survive in the world of machines and textile chemist & colourists. Walking into the workshop of Mohd Salim on a weekday, what welcomes you is an empty kadaai with no colours and dry water tanks, which highlight the sorry state of affairs. “I have just one staff today. There’s no work now. Last order has been dispatched a few days ago and I’m waiting for some new orders soon.” What used to be a busy time for them with the impending festive season in the city, is a now a lean continued patch. “Earlier, we used to get orders for colouring the materials used for pandals’ and its scaffoldings but with available Chinese and synthetic material in various colours, those days are gone,” the 58-year-old says. With the jute industry also facing major challenges, dyeing works in the jute sector has also vanished. Even for new clothes made during the festive season now, machine-dyed clothes are preferred, he adds. Born and brought up in the Chitpur area, Salim recounts the glory days when his father started the business and settled here from Rajasthan. 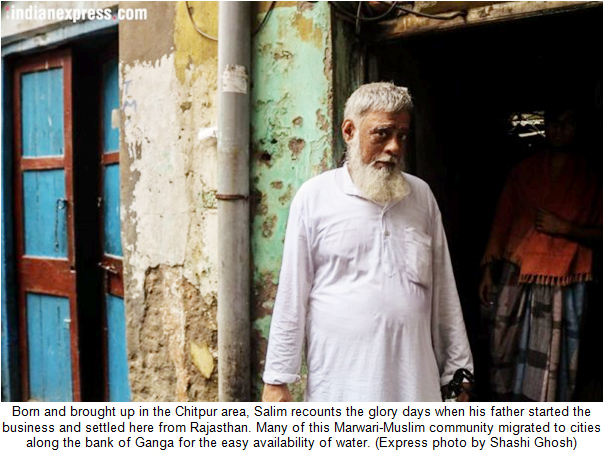 Many of this Marwari-Muslim community migrated to cities along the bank of Ganga for the easy availability of water. Kolkata was one of the most preferred locations in the pre-independence era owing to the British capital and Burra Bazar, a market entirely set up and managed by Rajasthani traders in those days. 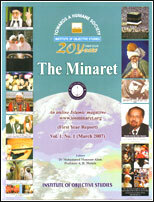 Uttar Pradesh is also home to many inhabitants of the Rangrez community. The traditional hand-dyeing works done by the Rangrezs were considered a great honour as it was associated with colouring ‘peelas and pagdis’ (yellow dupattas and headgear) – both essential requirements for Hindu weddings in Rajasthani communities. In Kolkata, Salim’s father worked with everything from cotton yarns to laces and dress material. 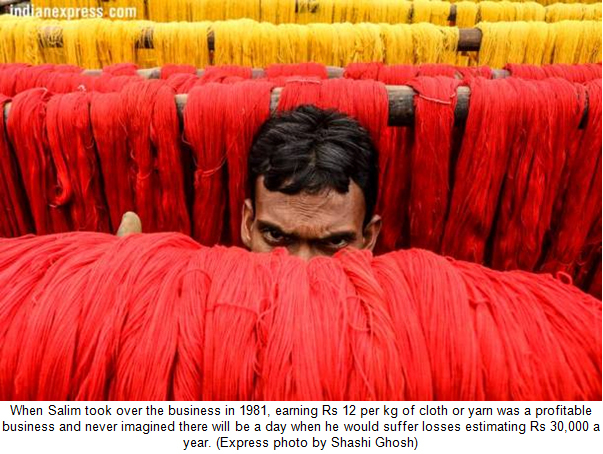 When he took over the business in 1981, earning Rs 12 per kg of cloth or yarn was a profitable business and never imagined there will be a day when he would suffer losses estimating Rs 30,000 a year. 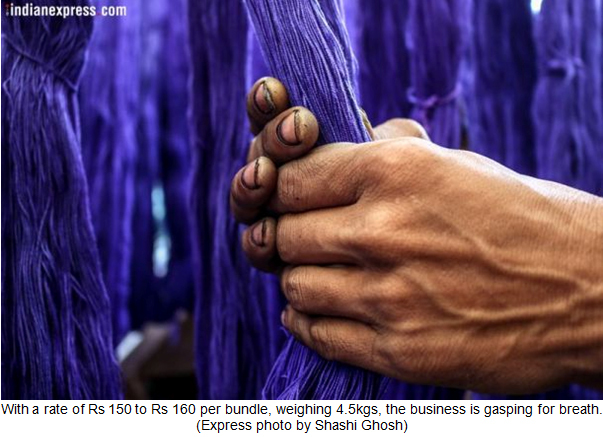 With a rate of Rs 150 to Rs 160 per bundle, weighing 4.5kgs, the business is gasping for breath. “The business has been down since 2004 but now it’s deteriorating even faster. Earlier, May to September used to be our most busy season. 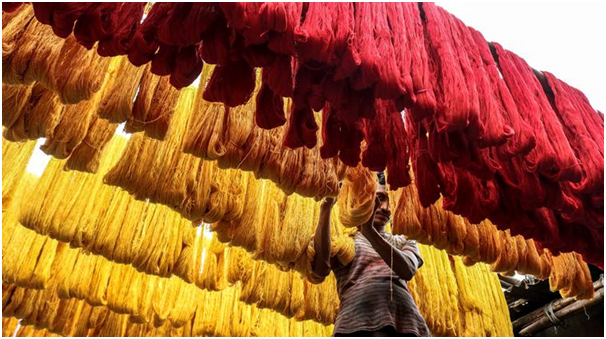 We used to get orders from Odissa to supply colourful yarns for Rath Yatra. Durga Puja and Diwali too was a great opportunity to get more orders,” he says. 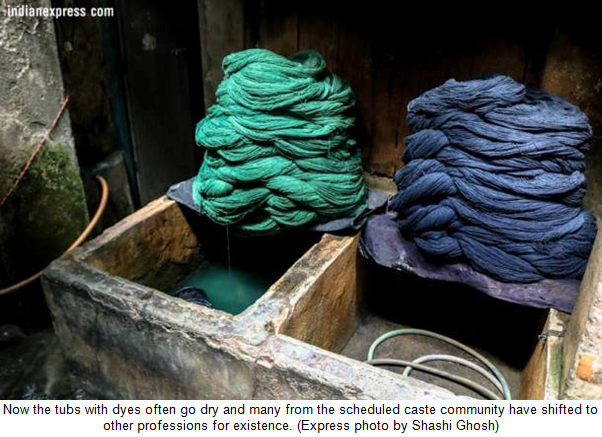 Now the tubs with dyes often go dry and many from the scheduled caste community have shifted to other professions for existence. Salim’s elder son works as a supplier for retailers delivering leggins and clothes to support his family. His youngest son helps him but is on a lookout to a secure job. “More and more work is done in factories, while we can complete a bundle in three hours, they can complete at least three to five times more. Moreover, as hand-dyeing is expensive, there are very few business owners who give us work now,” he explains. 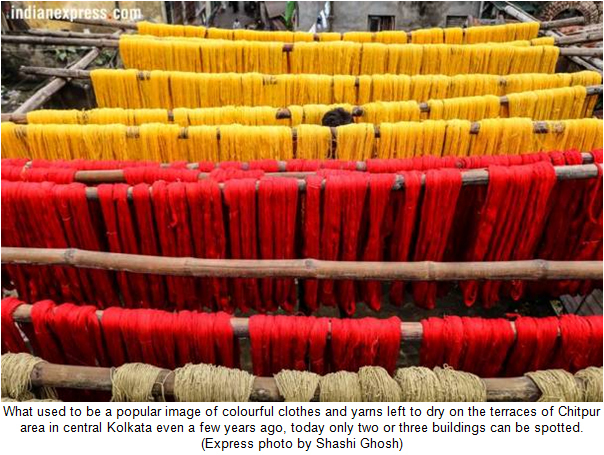 What used to be a popular image of colourful clothes and yarns left to dry on the terraces of Chitpur area in central Kolkata even a few years ago, today only two or three buildings can be spotted. “How will we survive? Forget younger generation even the government of Bengal does not know about us. So naturally, there is no one to raise concern and fight for our cause”, he says, emphasising that his family has been in the business since 1919 in Kolkata.